Performance apart, what differentiates Aspect from the many hundreds of other CTAs and managed futures funds? Longevity is one factor. Aspect was co-founded in 1997 but its track record dates back much longer to the early 1980s. Winton and Man AHL can also boast track records of comparable duration, not least since they and Aspect came from the same stable; David Harding was the ‘H’ in AHL, while Aspect co-founders Michael Adam and Marty Lueck were the ‘A’ and the ‘L’. Lueck reckons London is a global centre of excellence for CTAs mainly because AHL’s strong research ethos has helped to spawn many other CTAs that continue to invest heavily into research and systems. The three firms have all evolved in different directions and consequently their return profiles have become less correlated. Man Group has, for instance, diversified its investment universe for some strategies into non-exchange traded markets. Winton has, in contrast, for many years been moving away from momentum, or trend following. Aspect has done neither of these things. Aspect’s investment universe is, broadly speaking, the most liquid 150 or so futures markets traded globally along with a selection of developed and emerging market currencies, indicated below. This is likely to have a high overlap with the markets traded by other CTAs, which typically trade between 20 and 400 markets. It is the constancy of Aspect’s investment strategy that distinguishes the firm from many other CTAs. Aspect sets great store by having maintained a consistent style of trading, with medium term (multi-month) trend models still accounting for 80% of the risk budget. “The benefit of our experience led us to think that markets had not experienced any fundamental shift in structure, so the right thing to do was to be style consistent and not to drift,” asserts Lueck. But the simplest trend models, such as moving average crossovers, have not generated the returns Aspect has delivered; SG Prime Services’ SG Trend Indicator, based on a 20/120 moving average, ended 2015 with performance of virtually zero. Though Aspect has stuck to trend following in a big picture sense, immense effort has gone into four broad areas of research that have led to refinements: trend following itself; ‘modulating factors’; portfolio construction and risk management, and execution. “We are constantly making evolutionary, incremental, refinements,” says Lueck. Though some 20% of risk has, for ten years, been devoted to non-trend modulating factors, including relative value and carry, Aspect is still, after 30 years, squeezing more juice out of trend and has confidence in further improving the quality of returns. Disentangling signals from noise is vital because Lueck acknowledges that “trend following is a very weak signal over time.” For its core strategy, Aspect finds the shortest term trends are too ephemeral to trade, so they focus on a weighted average of trends over periods of between two weeks and six months, which works out at three months. Aspect is extracting cleaner trends by “incorporating incremental information around term structures, and market microstructure, to improve the signal to noise ratio,” explains Lueck. Here, calendar spreads are not directly traded but are used as a signal for other trades, and an example of modulating factors could include sentiment data. Of Aspect’s 119 staff, some 70 sit in R&D and the structure is “collegiate and team-based with open communication throughout,” says Lueck. The company seeks low-ego people, and eschews the “lone wolf and sharp elbowed ones,” reveals Lueck, and they can be rewarded with equity. Aspect is now owner-managed, being almost entirely owned by its staff, having bought back stakes from Man Group and AIG. Research projects are presented to the whole group on a weekly basis, which makes for “lively meetings and requires thick skinned staff who can accept constructive criticism!” Most of them probably can – average research team duration in the job is around nine years with the senior management team having been in situ over ten years. Says Todd: “We have an arduous recruitment process and one candidate had 22 interviews before being offered the job.” Aspect tends to hire PhDs from a wide range of disciplines, and also scours the academic press and conferences to source ideas. The firm has some academic joint ventures, which include sponsoring historical analysis, but the need to protect its intellectual property limits the extent of such collaboration as academics would generally want to publish research to advance their careers. Aspect tries to encourage a broad review of everything that could be done, using researchers’ tools and the latest shifts in market behaviour. “No idea is a bad idea,” says Lueck, but he tries to distil the ideas down into what is typically an agenda of 8-12 research projects. Those that yield actionable results are not fed into the model piecemeal, but rather get consolidated into new releases or versions of the model two of three times per year. Each individual project, be it on trend filters, modulating factors, risk or execution, gets a review very similar to a PhD peer review approach by independent risk teams “who are just as smart and quanty as the research team” Lueck assures us, but who have a separate management reporting line to maintain the independence of the process. “We are extra vigilant about how individual components react with each other and what the implications are for execution, workflow and order delivery,” stresses Lueck. This process can take months for some projects while others will continue to make marginal changes over periods of years. Virtually all of the process is systematic, but liquidity is one of a few very clearly defined areas where Aspect can exercise discretion to intervene, and recently did so in removing the Russian rouble currency. Liquidity and the quest for diversification benefits are the criteria for Aspect growing its investment universe, to approximately 150 markets and 190 contracts in 2016, but “we have not added any harder to access or illiquid markets,” claims Lueck. Liquidity has always been important as Aspect effectively needs to maintain daily liquidity for managed accounts that still make up most of assets. Foreign exchange is the only market that Aspect trades over the counter (OTC) and Todd says “our good relationships with many counterparties since 1997 help to foster healthy competition between counterparties, which benefits our investors who get high quality execution at the lowest price.” Nearly all execution is now electronic, although some of the currencies are traded as non-deliverable forwards (NDFs) by voice. Todd is keen to stress that a human execution team are actively supervising the execution process. The various ‘flash crashes’ (in May 2010, October 2014 for Treasuries, and August 2015) have had minimal impact on Aspect, “mainly because we are a medium term trend follower trading over timeframes of three months or longer – we are not high frequency traders,” explains Lueck. Aspect also think that their level of assets, at $5 billion, is easier to push around than $25 billion would be. Lueck summarises: “Our desire is to execute all business as cheaply and invisibly as possible, leaving no trace of our intentions, and ensure we are not exposed to being unable to close out positions quickly.” To this end Aspect has developed its own algorithms for execution purposes and is benchmarking these against third party offerings. “So far we are very pleased with the results, but we must always be cautious,” says Lueck. Aspect’s Senior Counsel for Government and Regulation, John Springett, works with a team of four in compliance who are constantly monitoring shifts in regulation. Aspect was not, in general, surprised by the CFTC’s Regulation AT proposal. “It continues the trend seen amongst regulators globally and similar provisions exist in MIFID 2 around risk management processes for automated trading,” observes Springett. The requirements for testing, risk controls, changes to algorithms, sign-offs and so on are being done at Aspect anyway; though Springett does expect that some changes may be needed to comply with “the letter rather than the spirit” of the rules as he views US regulators as being more based on rules than principles, but all of this is manageable. This concern very much echoes those raised by Schulte Roth & Zabel lawyers Brian T. Daley and Seetha Ramachandran, who THFJ interviewed on the topic in late 2015. Aspect regularly gets involved in AIMA working groups on regulatory issues, and belongs to one that is preparing a response. Springett hopes that the CFTC will abandon its ambitions on source code, and has some confidence in the power of engagement. He points out that industry submissions in relation to AIFMD remuneration requirements led to an outcome which “took our arguments into account” whereby proportionality allowed firms to retain more freedom over remuneration. However, he also notes that US regulators tend to take a less consultative approach than their European counterparts. Aspect also has been monitoring the SEC’s 18-f4 proposal on use of derivatives in mutual funds, which could in effect cap gross exposure at 150% for ’40 Act vehicles. This publication has interviewed John J.Mahon of Schulte Roth & Zabel, in this issue, who raised a number of concerns that chime with Aspect’s views. Says Todd: “This is a sledgehammer to crack a nut and we use leverage in a very controlled fashion.” Regulatory reporting is something that Aspect can handle, but Springett has found the differences in content and calculations for AIFMD Annex IV, Form PF and Form CPO PQR reporting does make the task something of a burden. Todd summarises Aspect’s approach to regulatory change as a “positive, proactive engagement.” Aspect get involved as early as possible in order to put arguments to regulators, and recently invited a particular regulator to drop by after an extended hiatus of visits. Springett is irritated that market access for non-EU funds still has to be done on a country-by-country basis via NPPRs, with the depo lite requirement in some markets essentially creating more paperwork by “repapering existing policies and processes.” Aspect has obtained UCITS passports in around ten countries. Aspect was one of the first CTAs to set up a UCITS, and from the start it has run pari passu with the Cayman fund. Originally structured as a total return swap with an index, the product moved to a note-based structure after ESMA changed the rules around indices. It remains pari passu. Aspect went down the DIY route to avoid any extra costs or fees (for managers or investors or both) associated with platforms. Aspect’s ‘40 Act mutual fund product is not pari passu but rather is a lower cost, lower volatility programme that charges no performance fee. These liquid alternatives products make sense because Aspect has spare capacity. 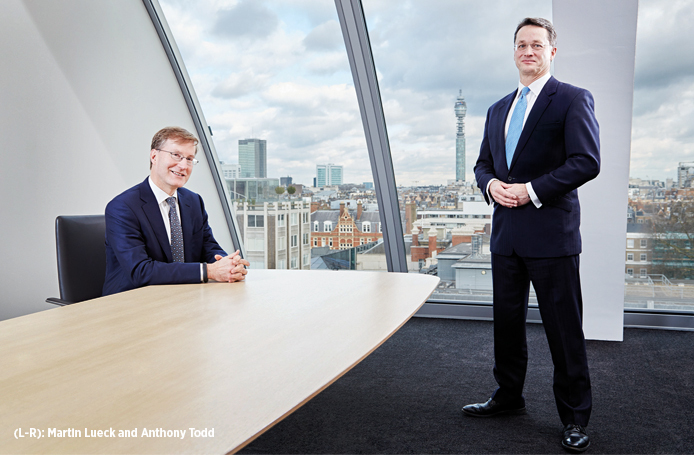 “Aspect is very conservative on capacity and conservatively estimates it at $10-12 billion based on how the current programme works and on current market liquidity,” says Todd. Aspect calculates that its $5 billion of assets are now well below capacity constraints so it is not constrained in any of the markets it trades. 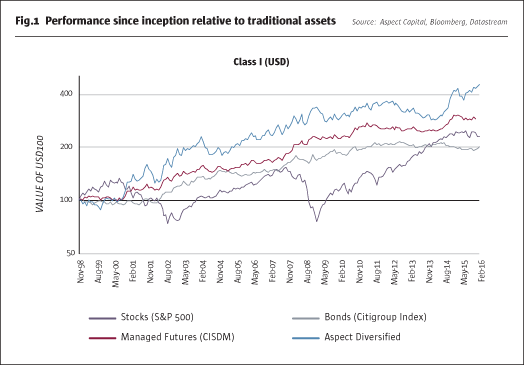 “We constantly monitor metrics including our footprint, slippage, consumption of open interest, and daily volumes.” Aspect has not noticed any deterioration of liquidity in most sectors, with the exception of foreign exchange where the past 18 months has seen a marked decline in turnover, partly due to some counterparties withdrawing from FX prime brokerage. At much higher levels of assets Aspect reckon they would start to hit position and exchange limits in some markets, and would then be forced to do one or more of: downsize or cease trading some smaller markets; slow down the models “to build capacity at the expense of investors,” in Todd’s view, or start trading more markets OTC to avoid being subject to the exchange limits. “Any of these approaches would be suboptimal,” according to Lueck. 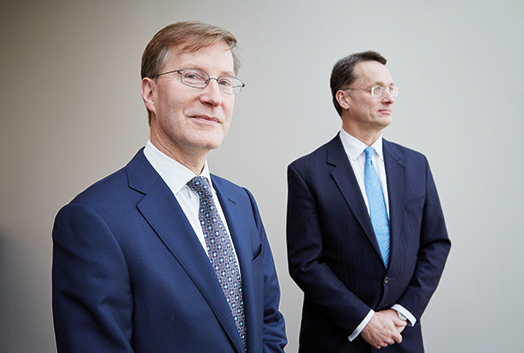 “Making managed futures institutional grade was always the mission and it has been a great journey,” reflects Lueck. Although private investors supplied most of the capital in the early days, Aspect did not start taking money until it had set up 24 hour execution and disaster recovery procedures. Although Lueck recalls managed futures generally being sold as a ‘black box’, Aspect offered investors transparency from day one. Nowadays Aspect offers transparency in forms including Open Protocol Enabling Risk Aggregation (formerly known as OPERA), RiskMetrics, or customised reporting. The willingness to tailor reports to client needs indicates a paradigm shift across the industry. “In the 1980s it was much more about the product, now it is much more about the client, so we take our core competency and then provide the core format,” says Lueck, who views Aspect’s relationships with clients as being “partnerships”. If the client wants a ‘fund of one’ that is what they will get, and Aspect also has an ERISA-compliant fund for certain US allocators. Aspect could also be open minded about setting up an exchange-listed closed ended fund in response to client demand. 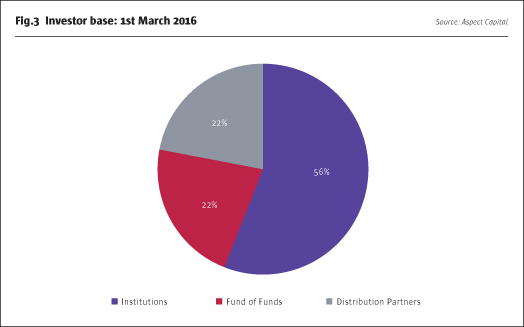 Aspect’s investor base as of February 2016 is illustrated in Fig.3. Distribution partners include one of Australia’s leading private wealth managers, Colonial First State. 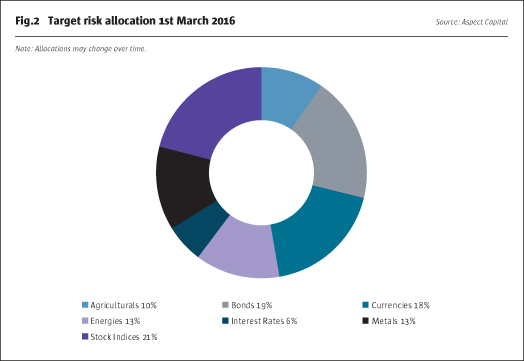 Aspect offered managed accounts from the start, and some 70% of assets are still in this structure. 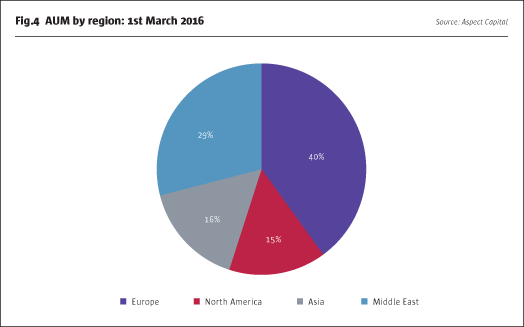 Aspect has a geographically diverse asset base; Asia contributes more assets than North America, and the Middle East provides almost as much as the former two combined. Since speaking to The Hedge Fund Journal, Aspect has completed the onboarding of new strategies with the acquisition of Auriel Capital Management. The founding team behind Auriel, Asif Noor and Anoosh Lachin, joined Aspect in February 2016 to develop systematic global macro and currency strategies. Longer term, Aspect wants to “identify high calibre systematic trading strategies that can use current infrastructure and provide diversity for the business and for clients.” This could include non-trend following strategies, that might have done particularly well in years like 2012 or 2013, but these will be kept quite separate from the core trend following strategy. In terms of where Aspect’s business and research is heading, the guiding stars are “ongoing enhancement of every component of the program, including more reliable information sources, and broader sets of markets,” said Lueck. Aspect is always testing model improvements, and the 7.9% return in 2015 would have been only 2% if running a simpler trend following system, according to Lueck. Aspect continues to expand its investment universe, with diversifying and liquid markets, and regulatory mandates for clearing seem to be conducive to this process. Aspect is planning soon to add some cleared, standardised, interest rate swaps, having previously been reluctant to use non-exchange traded instruments. Specifically, Aspect will be trading forward-starting Interest Rate Swaps with residual tenors of up to 10 years in the following currencies: CHF, NOK, SEK, NZD, CZK, HUF, PLN, SGD, ZAR and MXN. Aspect has traded credit default swaps (CDS) using proprietary capital, and could at some point consider adding them to the program. The firm is always researching new exchanges and markets and has ‘paper-traded’ Chinese commodities for about three years. Aspect now has the infrastructure in place to trade these markets, but “our prudent long term approach means we would need total clarity on the regulatory side,” explains Todd. Across all programs “we want to continue to drive down the visibility of our trading and our execution costs,” says Lueck. Some new releases might focus on trading costs, others on risk controls and others on portfolio construction. But one thing is clear: changes to the flagship strategy will always be incremental and avoid style drift from the trend following philosophy.